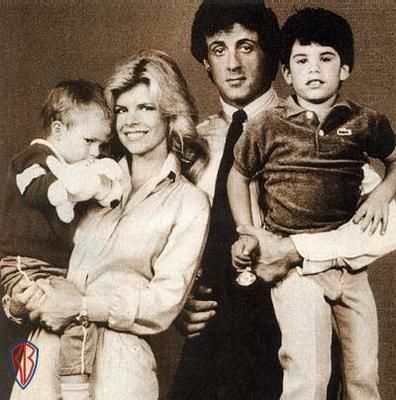 Sylvester Stallone Married Jennifer Flavin: living happily with their daughters and son Seargeoh Stallone. Find everything you wanna know about the family. Michael Sylvester Gardenzio Stallone is an American filmmaker, actor, and screenwriter who is best known for his Hollywood action roles like boxer Rocky Balboa in the film series Rocky series, soldier John Rambo in the movie Rambo and Barney Ross in the three The Expendables films. Talking about the marriage life, Sylvester has married thrice and divorced twice. His marital relation with Sasha Czack and Brigitte Nielsen failed thus married Jennifer Flavin in 1997. Hopefully, Sylvester and Jennifer's marital life is going smoothly. The couple has been together for 19 years and the relationship is still going on. Just right after around two years of divorce with Brigitte Nielsen, Sylvester Stallone started dating American actress Jennifer Flavin. Sylvester and Jennifer first met in August 1988 at a restaurant in Beverly Hills and the couple eventually fell in love with each other. The couple dated for around 7 long years. After such a long term relationship, the couple got engaged in 1996 and got married in the following year on 17th May 1997. The couple has been enjoying 19 years of their marital life and the relation is still going smooth and silk. Till the date, there are no any signs of separation or any divorce issues. The couple is happily living with their children and enjoying their marital relation. No any news regarding their fight or any problems in their 19-year long marital relation has ever been published in the news. Speaking of Sylvester's children, Sylvester and his first wife Sasha Czack is blessed with two sons. Sasha gave birth to their first son Sage Stallone on May 5, 1976, and their second son Seargeoh Stallone in 1979 who was diagnosed with autism. Sylvester and Brigitte did not have any children. He is also blessed with three beautiful daughters with Jennifer Flavin (third wife). Jennifer gave birth to their first daughter Sophia Rose Stallone on August 27, 1996. Sistine Rose Stallone is their second daughter born on June 27, 1998. She gave birth to their third daughter after four years of the second pregnancy, Scarlet Rose Stallone on May 25, 2002.